Frank Sinatra considered Kate Smith the best singer of her time, and said that when he and a million other guys first heard her sing “God Bless America” on the radio, they all pretended to have dust in their eyes as they wiped away a tear or two. The time was 1940. (Ed Note: Wikipedia has its first public singing occurring in 1938 on Kate Smith’s radio show.) America was still in a terrible economic depression. Hitler was taking over Europe and Americans were afraid we’d have to go to war. It was a time of hardship and worry for most Americans. Kate was also large; plus size, as we now say, and the popular phrase still used today is in deference to her, “It ain’t over till the fat lady sings”. Kate Smith might not have made it big in the age of TV, but with her voice coming over the radio, she was the biggest star of her time. Kate was also patriotic. It hurt her to see Americans so depressed and afraid of what the next day would bring . She had hope for America , and faith in her fellow Americans. 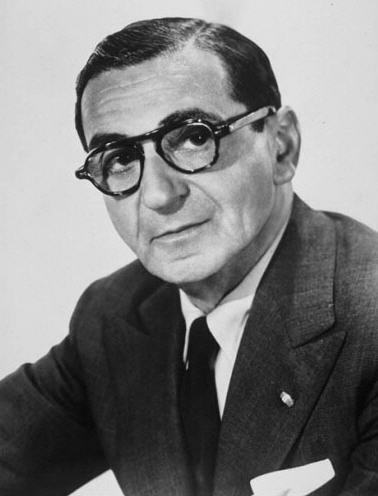 She wanted to do something to cheer them up, so she went to the famous American song-writer, Irving Berlin (who also wrote “White Christmas”) and asked him to write a song that would make Americans feel good again about their country. When she described what she was looking for, he said he had just the song for her. He went to his files and found a song that he had written, but never published, 22 years before – way back in 1917. He gave it to her and she worked on it with her studio orchestra. She and Irving Berlin were not sure how the song would be received by the public, but both agreed they would not take any profits from God Bless America . Any profits would go to the Boy Scouts of America. Over the years, the Boy Scouts have received millions of dollars in royalties from this song. This video starts out with Kate Smith coming into the radio studio with the orchestra and an audience. She introduces the new song for the very first time, and starts singing. After the first couple verses, with her voice in the background still singing, scenes are shown from the 1940 movie, “You’re In The Army Now.” At the 4:20 mark of the video you see a young actor in the movie, sitting in an office, reading a paper; it’s Ronald Reagan. Now that you know the story of the song, I hope you’ll enjoy it and treasure it even more. Many people don’t know there’s a lead in to the song since it usually starts with “God Bless America …..” So here’s the entire song as originally sung….. ENJOY! This actually happened on Sept. 2. Today, Aug. 14, 2015 is being called the 70th Anniversary of the end of World War II as that was when Americans heard that Japan, inspired by the atomic bombings of two of its cities, announced it would surrender. That the war ended without an invasion of the islands spared the lives of millions, mostly Japanese and other Asians, but many young Americans, British, Australians and New Zealanders as well. 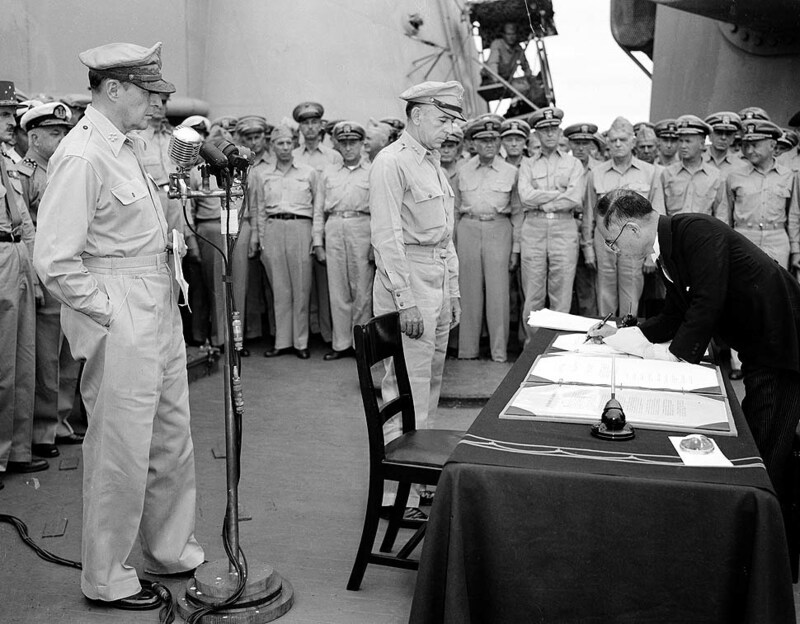 It should be noted that the United States commemorates the war’s end — as does China — on Sept. 2 when Emperor Hirohito signed the surrender papers on the USS Missouri but this was the day Japan announced it would quit. The Brits celebrate it Aug. 15 as that was the date upon which they heard the announcement due to time zone differences. It should be further noted that the Soviets did not end their assaults on Japanese occupied Manchuria and Korea until Sept. 2. 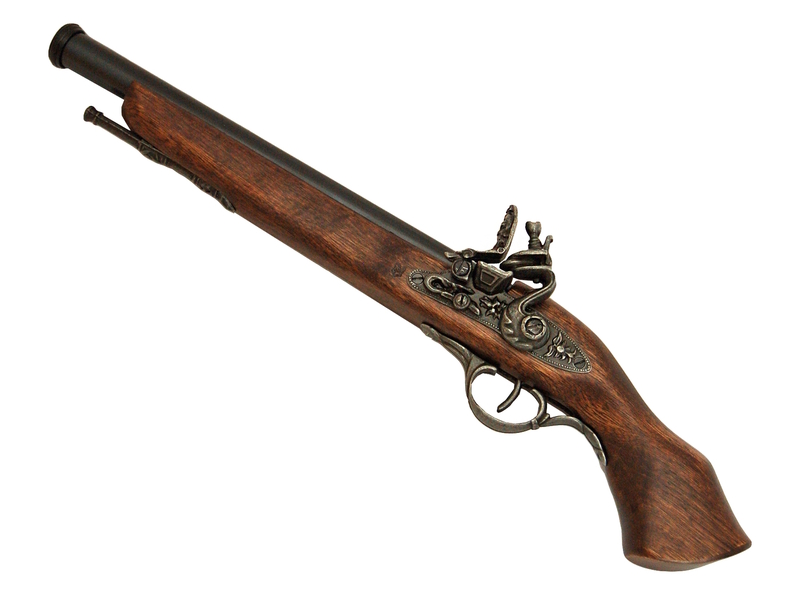 The South won the first, Fort Sumter, and last, Palmito Ranch, battles of the Civil War. The Battle of Palmito Ranch near Brownsville, Texas, occurred May 12-13, 1865 more than a month after Robert E. Lee’s surrender at Appomattox Court House. Historians today are still confused as to why it was fought. Union Private John J. Williams of the 34th Indiana is believed to have been the last man killed in combat. Capitol Bean Soup As Per Chef Bill Sr. Congressman Joseph Gurney Cannon, the father of Capitol Bean Soup. 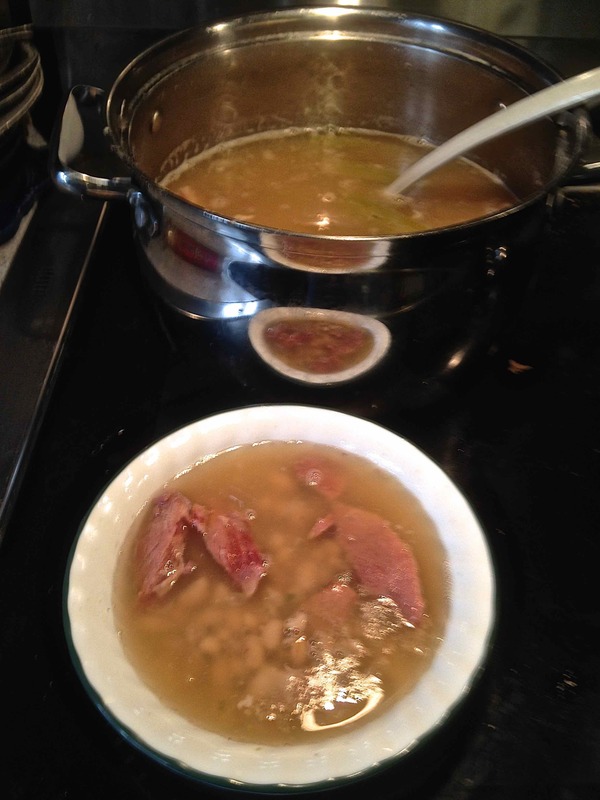 Chef Bill Sr has gotten a query regarding one his favorite dishes — the U.S. Capitol Bean Soup. The dish is served every day in all 11 Capitol dining rooms at the demand, according to legend, of Speaker of the House Joseph G. Cannon. 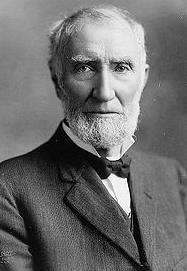 Cannon, a Republican, represented various parts of Illinois from 1873 until 1923 with a two-year hiatus coming when he lost the 1912 election. He served as Speaker from 1903 until 1911 and was the man who graced the first cover of Time Magazine on March 3, 1923. Strain the water from the soaked beans and put in a big pot with 3 quarts of water and the ham bone or ham hocks. Bring to a boil, then reduce heat and simmer for 2 hours. Stir the veggies and herbs into the pot–and the mashed potatoes for the Senate version–and cook over low heat for another hour–until the beans are nicely tender. Remove the bones from the pot then the meat into bits and return that to the pot. Discard the bones. For authenticity crush a few of the beans in each bowl to thicken the broth. 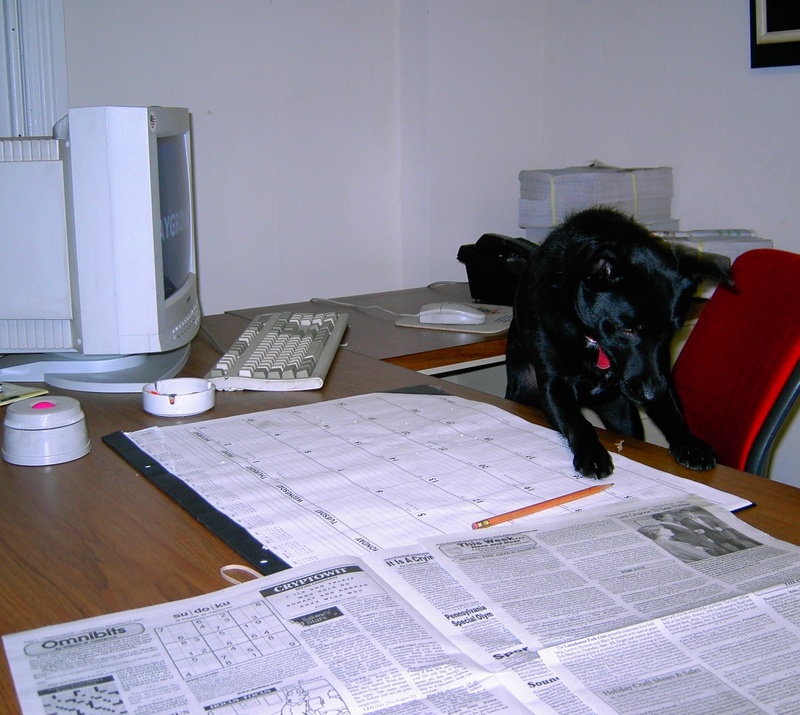 Author BillLawrencePosted on February 26, 2015 September 20, 2017 Categories Food & Wine, History4 Comments on Capitol Bean Soup As Per Chef Bill Sr. The languages of Europe, India and Central Asia are mostly descended from the Proto-Indo-European language spoken 6,000 years ago. Scholars have been trying to figure out what it sounded like and think they have come close. Here is the parable of the sheep and the horse as it might have sounded in 4,000 B.C. with the translation below it. 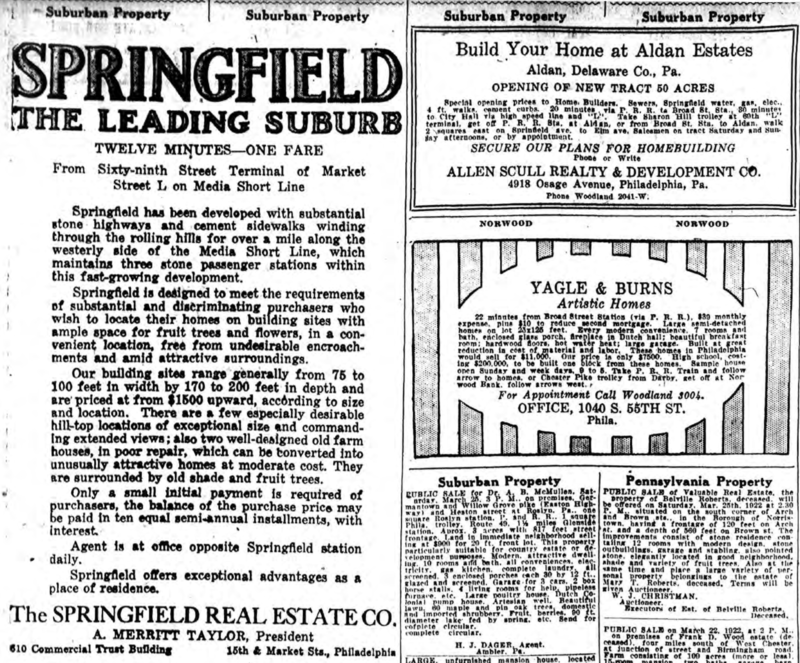 The below advertisement appeared in The Philadelphia Inquirer in 1922 for building sites in Springfield, Delaware County, Pa. It called the town “The Leading Suburb and noted it was just 12 minutes and one fare from the Sixty-ninth Street Terminal. It described it as a “fast-growing development” and called attention to the three stone passenger stations on the trolley line. The developer, A. Merritt Taylor of the Springfield Real Estate Co., sold building lots of between 1,500 and 2,000 square feet that contained “ample space for fruit trees and flowers”. He noted that there were “a few especially desirable hill-top locations of exceptional size and commanding extended views”. He also noted that he had “two well-designed old farm houses in poor repair which can be converted into unusually attractive homes at moderate cost”. The farm houses were surrounded by old shade and fruit trees. The properties started at $1,500 and he had an agent daily opposite Springfield (presumably Springfield Road) station. We just caught Foxcatcher at Regal Edgmont Square 10, which was just a mile or so from where all the action happened. Steve Carell nails John du Pont. He deserves an Oscar. Was the movie entertaining? Well, it was like spending 134 minutes with John du Pont. Thanks for 134 minutes of misery, Mr. Carell. You should be investigated by the Senate Democrats. Some observations, Mark Schultz (Channing Tatum) is told on his initial helicopter ride to Foxcatcher that du Pont would have been piloting himself had he not been providing tactical assistance to the “Newtown Square” Police Department. That should have been Newtown Police Department as Newtown Square is the postal address not municipal name. When police are shown, however, the shoulder patches are correct as are the names on the cars which even have the color scheme we remember. Yes, du Pont did at times provide aerial assistance to the Newtown Police. The mansion used was in Leesburg, Va. as the actual site was torn down in 2013. You would not see the background hills in Newtown Square. We don’t remember as much snow on the ground when the Jan. 26, 1996 shooting of Dave Schultz (Mark Ruffalo) happened. Ruffalo was also very good, by the way. There is one scene where John’s mother, Jean Liseter Austin du Pont (Vanessa Redgrave) is pushing du Pont to give away his toy trains. He never did. 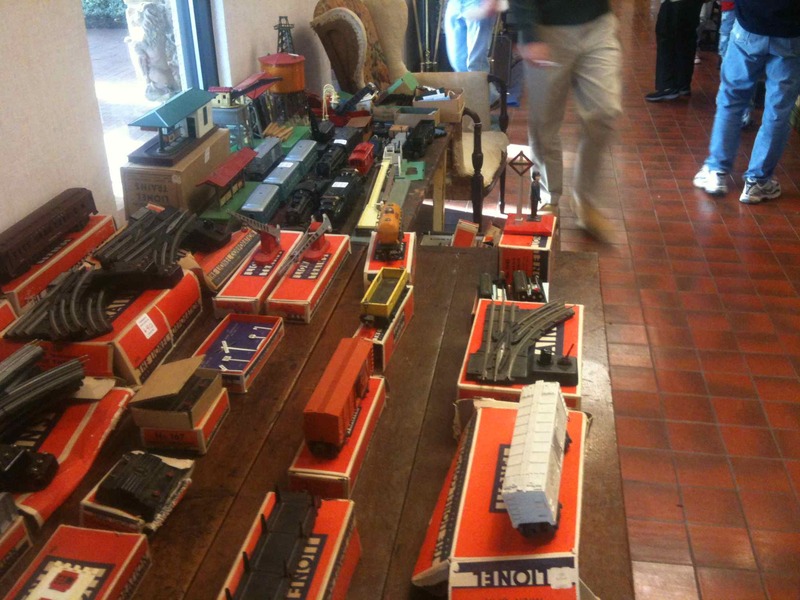 Below is a shot of his train set from his Nov. 26, 2011 estate sale. For what it’s worth, yesterday, Dec. 9, was the fourth anniversary of his death. Today, Dec. 7 marks the 73rd anniversary of the attack on the U.S. Navy fleet at Pearl Harbor, Hawaii. It’s “a date which will live in infamy,” said President Franklin Delano Roosevelt at the time. This act was the catalyst which drew the United States into World War II, ultimately leading to the victory of Allied powers around the globe. For information about the attack visit here. It was called into session by Charles I and wound up cutting off his head. It’s kind of an appropriate Omnibit for today. It should be noted that those responsible for Charles’ execution were themselves executed when the Royalists returned to power in 1660, some by being hanged (to near death), drawn (removal of bowels while still alive) and quartered (cut in pieces after death). One of those subject to such was Major-General Thomas Harrison, who remained cheerfully unrepentant during his ordeal. He reached over and smacked his executioner during the disemboweling, which cause his head to be prematurely removed. It seems much aggravation could have been avoided if Parliament merely impeached Charles.